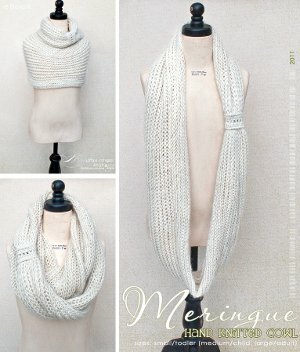 This Vanilla Meringue Cowl Knitting Pattern can be worn several different ways, making it the ultimate winter accessory. This knitted cowl is great for knitters of all skill levels and makes a wonderful stocking stuffer for the holiday season. The light color and simple style make it a great accessory with any outfit. White and tan knitting patterns make great go-to accessories, because they can add airy touches to any outfit. Whether you're heading to the grocery store or on you way to a fancy event, this knit cowl pattern will keep you warm and toasty. You can pull it down over exposed shoulders or wear it around your neck to keep your face warm - the possibilities are endless. This cowl looks like a fancy accessory from a store at the mall, so be sure to see if your friends can tell the difference. Find even more free knit scarf patterns to love in our extensive collection of gorgeous knitting patterns, 59 Free Scarf Knitting Patterns.This gorgeous collection contains cowls, simple scarves, and more intricate, intermediate patterns. Fisherman’s Rib: CO even amount of sts. Row 1(RS): [K1, p1] across. Row 2: [K1, yo, sl 1 purlwise] across. Row 3: [K1 tog with yo from the previous row (knit the stitch that was slipped in the previous row together with its yarn over), yo, sl 1 purlwise] across. Rep Row 3 for Fisherman’s Rib patt. Crab st: (backward sc): Ch 1, sc from left to right, instead of from right to left (as in sc). With smaller needle and MC, CO 12 (18, 22) sts. Row 2(inc): kf&b across = 24 (36, 44) sts. With larger size needles, work in Fisherman’s Rib for 38 (44, 54)”/96.5 (112, 137) cm, ending with RS row. Next Row(WS): With smaller size needles, p across. Next Row(dec): K2tog across = 12 (18, 22) sts. BO all sts. DO NOT cut yarn. Row 1(RS): With RS facing, slip loop onto crochet hook, working along BO edge of Body, ch 1, sc in each st across, turn = 12 (18, 22) sc. Row 2: Working in front loops, ch 3, dc in each sc across, turn. Row 3: Working in both loops, ch 4 (counts as dc and ch-1 sp), sk 1st dc, dc in next dc, [ch 1, sk next dc, dc in next dc] across, turn = 7 (10, 12) dc and 6 (9, 11) ch-1 sps. Row 4: Ch 3, dc in 1st ch-1 sp, 2 dc in each ch-1 sp across, turn = 12 (18, 22) dc. Row 6: Working from left to right, ch 1, reverse (crab) sc in each dc around, leaving long yarn tail, fasten off. With RS of Band facing, sew Band to RS of Body facing (do not twist). With RS facing, join MC with sc around last st of Row 1 of Band, working from left to right in free loops of Row 1, ch 1, reverse (crab) sc in each dc around, leaving 10-15” yarn tail, fasten off. Thread yarn tail through yarn needle and with RS of Band facing, join short edges of Band together. Once you start knitting cowls, you may not want to stop. Luckily there are plenty of patterns in the eBook 12 Knitted Scarf Patterns: Fabulous Free Knitting Patterns for Beginners to keep your needles moving. Cowls are just the beginning - there are a ton of other free scarf patterns for you to enjoy. The variety of styles and colors will get you in the mood to knit. 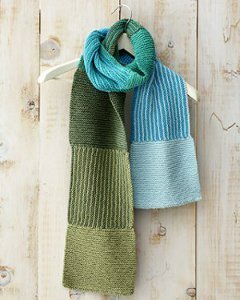 Make one for yourself and another for a friend - knit scarf patterns make great gifts. Very confusing I am an experienced knitter.